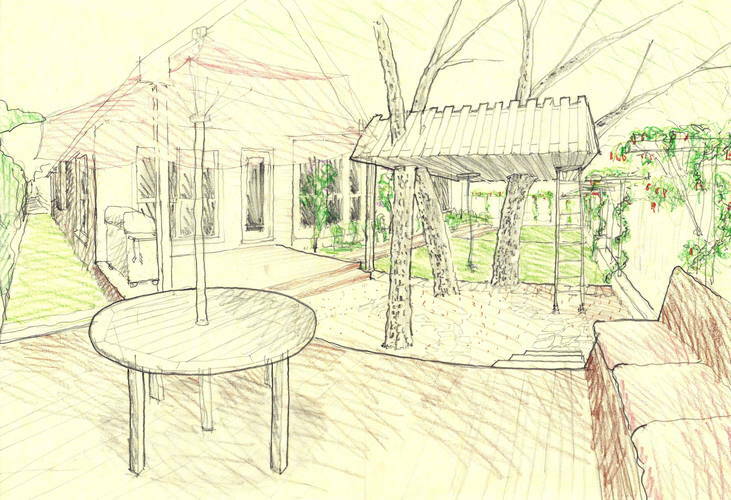 I was interviewed by Jennifer Hiller for her article for the Express-News and was pleased to see it run with my conceptual design sketch for a series of outdoor rooms I proposed as additions to a house. There are three areas to extend the interior kitchen and breakfast rooms: a covered porch, a mulch-floored room with a tree house above for the kids, and an open deck with built-in seating. Also published with the article is a photograph of the open plan kitchen of the Holland Avenue Residence. Please view the article on-line or see excerpts below. Home design has gotten practical and wandered outside. Outdoor living areas and no-nonsense spaces such as home offices and mudrooms are among the most popular trends in home design, according to the latest survey from the American Institute of Architects. Kermit Baker, chief economist with the AIA and senior research fellow at Harvard University’s Joint Center for Housing Studies, said post-recession design dollars are being directed toward practical rooms that people use the most, such as great rooms and master bedrooms, or mudrooms where families can stash shoes and backpacks. Low-maintenance or energy-efficient features are popular, as are things such as docking stations for phones. Other practical features trending in home design: tankless water heaters, recycled materials, water-saving features, extra insulation, ramps and elevators, storm-resistant design, automated lighting and first-floor master bedrooms. Additions or alterations to existing homes are popular. And even people with large budgets are spending it in a focused way, Baker said. “It’s not just, ‘I have some extra money to spend on my home,’” Baker said. Architect David Bogle of Syncro Architecture Studio, said many clients want to renovate existing homes, whether it’s one they already live in or one they’re purchasing, and may take their time. Including outdoor living areas as “rooms” of the house is one way to extend the home and take advantage of the yard — and the budget. “The idea is that through affordable and ordinary, inexpensive, everyday materials you can achieve great things through design,” Bogle said. Bogle recently did a conceptual drawing of a townhome project for a developer who wants to target empty nesters. All the townhomes would have elevators — which would make it easier to age-in-place (another design trend) — installed or as an option. via Multiuse rooms, open floor plans among trends – San Antonio Express-News. Posted in architecture, blog, homes, publications. RSS 2.0 feed.